Kavli Nanolab Delft is the research facility for nanofabrication at TU Delft and we are part of the university's succesful Kavli Institute of Nanoscience Delft. Together with TNO we use the cleanroom facilities of the Van Leeuwenhoek Laboratory (VLL), one of the largest nanotechnology research cleanroom in Europe. 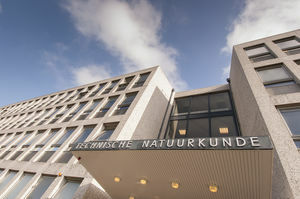 We are also partner in NanoLabNL (www.nanolab.nl), the Dutch national facility for nanotechnology reserarch that provides a full-service and open-access infrastructure for R&D in nanotechnology. Additional facilities for micro-manufacturing are available in our TU Delft sister laboratory Else Kooi Lab (EKL). The Kavli Nanolab provides a technological infrastructure for the fabrication and inspection of functional nanostructures. The facility specializes in high-resolution charged particle-beam structuring down to sub-10 nm details, fabrication of quantum devices and bio imaging and super resolution microscopy. Kavli Nanolab offers 24/7 low-threshold user access to high-end, state-of-the-art process and inspection equipment for academic as well as industrial users.